Summer Hill Physio | Healthy Shoulders: The importance of scapular position in your upper body workouts to ensure optimal movement patterns. Lets begin today’s blog post with a basic recap of the structure of the shoulder joint with emphasis on the shoulder blade AKA scapula. The shoulder joint is a “ball and socket joint” and it has the greatest range of motion of any joint in the body. The scapular (shoulder blade) provides the “socket” and the “ball” is the head of your humerus (upper arm bone). The clavicle (collar bone) joins the scapular to the sternum. What this illustrates is what many people often don’t know or over look- it is all connected. The position that your shoulder blade sits in impacts the position of your shoulder joint. Without the contribution of the shoulder blade, you would be limited to approximately 120° of shoulder movement. – Abnormal stresses to the anterior capsular structures of the shoulder. – Decreased shoulder complex neuromuscular performance. 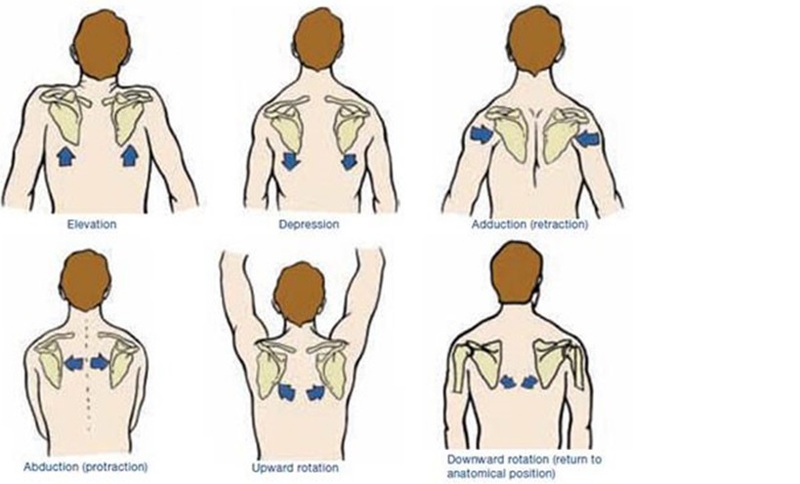 All of the above essentially means if you are not mindful of your scapular position, you are likely, at some point, going to suffer from some shoulder pain/discomfort or eventually end up injuring yourself. This all ultimately impacts negatively upon your training – which is not what we want! Overall stability and efficient motor control in all of these directions is essential. It’s that simple. Basically you are pulling your shoulder blades down (depression) and back (retraction) engaging the rhomboid, middle and lower trapezius muscles creating torque and stability at the glenohumeral joint. You will notice an immediate difference in your set up/ feel of the exercise. Don’t be surprised if you feel stronger. Training a movement with the optimal position and loading of muscles creates a more stability. The correct position of the scapular is a great starting point for correcting movement patterns, optimizing muscle recruitment and injury prevention However, it is only 1 piece of the puzzle. In order to achieve optimal scapular stability we need to train the muscles that influence the shoulder blade (listed above). Adequate strength in the muscles that help move and stabilize the shoulder blade and subsequently the shoulder joint. This is the big picture solution and long term key to shoulder health and longevity with your training – This however is another blog post in itself! So in short to address the above – The scapular muscles must dynamically position the shoulder blade so that efficient shoulder movement can occur. When weakness or dysfunction of the scapular musculature is present, normal scapular positioning and mechanics may become altered. If we are unable to position the shoulder blade well during exercise, you can predispose yourself to injury. Here’s a video which sums up this blog post whilst giving you a visual explanation regarding how to position your scapular. Video is from Jeff Cavaliere an American physical therapist and strength and conditioning coach. The emphasis is on chest training in this video. Enjoy!